This review contains spoilers for the previous books. The story begins with Percy taking part in orientation at his new school, the one that his mom’s new boyfriend set him up at. Now, everything about Paul seems fine, but I’m not terribly trusting anyway. And at school of course things go wrong. Also, seems I was absolutely right about someone who was introduced in the last book— bit strong foreshadowing, I think. Once at camp, Percy reunites with his friends and, erm, relatives, and it’s clear that despite Nico having stormed off in the previous book, it turns out I won’t have to wait to see more of him, yay! Because well… Percy’s got a mirror like Dumbledore or Galadriel and gets to spy on Nico as he has a very depressing conversation with a ghost. 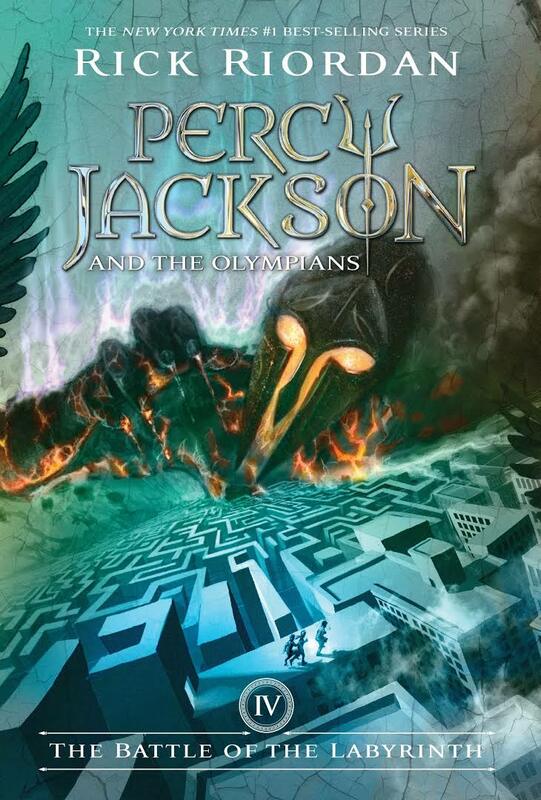 There’s no peace though, and as every summer, there’s a quest, and surprisingly Annabeth gets asked to lead it. Good for her! I rather enjoyed having her in the hot seat, though of course Percy goes along. They’re hoping to stop Luke from invading camp through the labyrinth. And what a fabulous bunch of beasts and monsters it is! From the three-torsoed man, to the creature with one-hundred hands and fifty faces, and having gods and flesh-eating horses as well… I absolutely loved the image of Kampê who had wings that stretched dozens of feet— I won’t spoil it, but we got a very clear visual image of that. And now back to what really matters: Nico. Just kidding, but I was really enjoying his growth in this book! I knew that he wouldn’t remain a villain for long so I was never really scared of him or worried about what he might do, or rooting against him actually. He’s a bit like Draco except Harry isn’t just keeping a wary eye on him, but rooting for him to be a good guy. Bleh, what a mistake you made there, Harry. Anyway. When Grover was told that he only had a week to find Pan in the beginning of this book I knew this was the book we would be getting that answer about the Wild God, but when Grover and Tyson split off from the group I admit I began to worry! I didn’t think it was terribly likely, but possible that there would be no Pan, that Grover and Tyson would not be coming back from their side adventure. It would have been heavy, but as these books mature, I wouldn’t put something like that past them. SPOILER: This book pained me far more than was necessary. Calypso, Pan and Nico… Especially after Zoe’s and Thalia’s farewell in the last book. Thalia was such an interesting character as well, I wish her all the best. That little punk. I mean. No matter how you slice it, the kids at Camp Half-Blood are often from single-parent homes. None of these kids has an easy time, and I don’t think the last book is gonna be any easier on them.